In the wake of yet another big operating loss, industry analysts are once again saying that Take-Two Interactive makes great games but needs to crank them out faster if it ever wants to return to profitability. Another day, another quarterly report, another multi-million dollar loss: Such is life at Take-Two. The company reported a net operating loss for its first fiscal quarter of $33.8 million yesterday, a considerable improvement over the $53.8 million it lost in the first quarter of fiscal 2009 but still an awful lot of money. 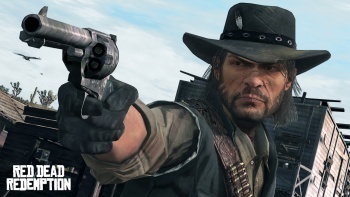 The publisher also revealed that Rockstar's newest game, Red Dead Redemption, had been delayed by three weeks, which analysts said was actually good news for the company in the short term but also symptomatic of its greater overall problem: An inability to get games done in a decent amount of time. "Red Dead Redemption was delayed into Q3, which ironically we believe actually helps Q2 earnings as it is unlikely to be a profitable title given the over 3-4 years of development costs and very heavy marketing spending," Signal Hill analyst Todd Greenwald wrote in an investors note. "While Take-Two's remaining line-up is chock full of highly anticipated, AAA titles, we remain concerned about the profitability of these titles," he continued. "Take-Two is still significantly unprofitable, even in a six month period which includes blockbuster releases like Red Dead Redemption, Mafia 2, Max Payne 3, L.A. Noire, Civilization V, and NBA 2K11." Michael Pachter of Wedbush Morgan agreed with the assessment, saying that while Take-Two is definitely not a "one-hit publisher" as some critics claim - that one hit being Grand Theft Auto, of course - it can't turn a profit simply because it takes too long to make games. "The average Take-Two game takes far longer than the industry average of two years in development, and the company must amortize an additional year or more of development cost for each of its major franchises," Pachter noted. "The continuing delays of Max Payne 3 (six years in development) and Mafia 2 (also six years) suggests to us that these games cannot be profitable, and until the company can streamline its average development time, leads us to the conclusion that it cannot deliver sustainable profits," he said. "If the company were able to compress the development cycles for its triple-A titles in financial year 2010, we believe that its development costs during the fiscal year could have been at least $60 million lower." Can Take-Two make deep cuts in the development cycles of its biggest franchises without sacrificing quality in the bargain? From a gamer's perspective, production quality is paramount, but in the eyes of the investors who actually keep the company afloat, profits are the priority and ultimately, whether or not the publisher can cut times without cutting important corners simply may not be relevant.